Also Called: Tumbling mustard, tall mustard, jim hill mustard. Stems: Erect, simple below, much branched above, glabrous to sparsely hairy at base. Leaves: Alternate, stalked; lower leaves oblanceolate to spatulate, 1.6 to 9 inches long, .4 to 1.6 inches wide, pubescent, pale green, pinnately cleft nearly to midrib; segments in 5-8 pairs, linear and entire to lanceolate and toothed; upper leaves smaller, divided into thread-like segments. Inflorescences: Racemes, numerous, terminating branches, elongating in fruit. Flowers: 2/5 to 3/5 inch across; sepals 4, awl-shaped, in 2 opposite pairs, margins membranous; petals 4, 1/4 to 2/5 inch long, ovate to spatulate, pale yellow, longer than sepals; stamens usually 6; stalks spreading ascending. Fruits: Pod, ascending or spreading, linear, 2 to 6 inches long, less than 1/16 inch wide, straight, glabrous; stalk about as thick as pod, 1/5 to 2/5 inch long; seeds several in 1 row, oblong, about 1/25 inch long, plump, smooth, yellow to brown. Habitat: Pastures, grain fields, roadsides, waste places; open, sandy or rocky ground. Origin: Native of Eurasia. Introduced and now established over much of the United States. Toxicity: May accumulate nitrates and cause digestive tract irritation. However, livestock will seldom eat large enough quantities to cause poisoning. 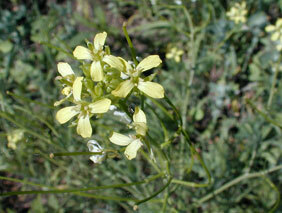 Uses: The Navajo would make a mush from tumble mustard seeds and goat's milk. The seeds are eaten by small mammals and ground foraging birds. Comments: Tumble mustard can be a problem weed. The common name refers to the mature plant's habit of breaking off at the crown and rolling in the wind like a tumbleweed, scattering the seeds. It is said to have spread westward along the railroads and is sometimes called Jim Hill mustard after an early railroad baron.